Graded video games are becoming more and more common. When a game is graded, it is evaluated on the conditions of the box, cellophane, price stickers, and circulation status. The actual contents, inserts, and video game cartridge or disc are usually exempt as they cannot be accessed and inspected on sealed games. After it is inspected it is given a grade correlating to the condition it is in. The most prevalent grading authority in the video game world is the Video Game Authority, or VGA, a subsidiary or the Collectible Gaming Authority. Until recently only sealed games were graded but recently cartridge only or complete but opened games have been added to the list of eligible items. Should you get your games graded? Below are pros and cons to consider when deciding whether video game grading is right for you. Graded video games sell for more: Recently, a VGA graded copy of EarthBound went up on eBay and ended at $4,700. 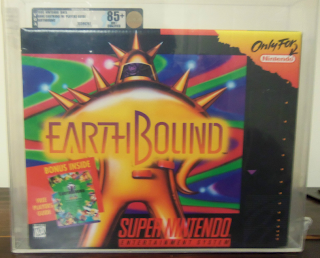 The average price of a complete Earthbound is 10% of that price at an average of $493. This is just one example but graded versions of games do sell for more than non-graded versions of the same game, even if they are in same condition. Graded video games get sealed by the authority: After the VGA grades a game they seal it in an acrylic case. For a slight fee, you can even have it sealed in a special Lucite case that blocks up to 99% of UV radition. This sealing will prevent damage from moisture, insulate, prevent pest damage, protect from falls, and prevent fading from UV. Grading can take time: Depending on how much you are willing to pay, the turnaround on grading a game can be up to 45 days so if you are looking to make some fast cash, grading is not the way to go. Grading costs money: The VGA can charge you up to $295 to grade your game. The minimum is $25. There are also additional fees and charges that can add up. 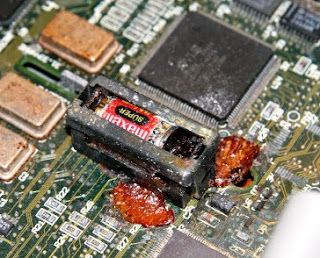 Sealing a game does not preserve it: Sealing a game does help protect it but it does not preserve it. Batteries and chemical components in some video games will degrade over time, destroying the game and box, even if it has been sealed. Since the sealing process uses just air, instead of an inert gas such as argon, the oxygen in the air can continue to catalyze and break down things inside the acrylic case. Can we trust the VGA: They are incredibly secretive and are themselves not verified by a third-party. They set their own standards and there is no quality control by another party. You can’t unseal it: If you want to remove the game from the acrylic case, you void the grade. You can never take it out and play with it, the grade is no longer valid. You have to resubmit it after you’ve opened it. Grading is not a new phenomenon. There exist several grading authorities for comic books and collectible sports cards and it is only natural that more and more authorities pop up as newer markets emerge such as video games. However, there is an important lesson to learn from these previous emergences of grading in other markets. Comic Buyers Guide wrote an article about the biggest events related to comics in the 1900's, the last event is the most telling for video games. It explains how grading can lead to a speculative market where the prices of graded games increase dramatically and then crash after the market gets over saturated. This will happen in video games, it is only a matter of time as more and more high-profile sales of graded games push profiteers to start buying up games just to get them graded only to resell them and flood the markets. The bubble will burst. For the time being, you can make good money by buying, grading, and selling games but there is another important argument that needs to be made. When you grade a game, you lock it in an acrylic prison. It defeats the very nature of a game; a game is something that is meant to be played. I myself would not grade my games because for one, I mostly own cartridges only and also, I like to play them! Good article. I hadn't considered the decay of backup batteries. It'll be interesting to see what effect that has on collectible games over time. The real thing is their expertise and authority. Unproven, clandestine and arbitrary. That's the reason to stay away. Would it be possible to remove the oxygen from a cartridge and fill it with argon or something? That would be a neat way to keep collected, and boxed, games in the best condition. Though I doubt you could play it anymore.